Growing up, my family went on two long vacations a year, always to the same two places. In March we head to Boca Grande, Florida where we stay in a beautiful house or condo on a private beach. We spend the 2+ weeks sunning and exploring the cute shops in town by day, and by night indulging at the same delicious restaurants or having fun cooking at home. In the summer, we make the trek to our family island in Canada, which is pretty much glamping. Canada is rustic, but it’s comfortable, familiar and completely relaxing. On the other hand, Matt grew up adventuring to new locations and foreign countries on vacations with his family. I was so stoked when Matt and I decided to take our first real vacation, just the two of us, to a place neither of us had been, Costa Rica. I’d never done an adventure-style vacation like this so I honestly, and embarrassingly, had no idea what to expect. But Matt took the reigns, made the plans and reservations, and we used my brief time off between quitting my job and starting school to go to Costa Rica. Although here were a couple nights where we stayed in very humble hostels as we traveled from one place to another, we spent the majority of our trip in two places; first in Monteverde in the Cloud Rainforest and then in the surfer beach town of Santa Teresa. In Monteverde, we took the suggestion of Matt’s uncle and stayed at the remote and breathtaking lodgings of El Sol. El Sol was an incredible experience to say the least. We stayed in a brightly colored private cabin complete with mini kitchen and a front porch looking out onto the rolling hills of the Cloud Rainforest. Our fresh and authentic Costa Rican meals were delivered to our door at the requested time by the friendly and accommodating staff. My favorite meal was the delicious breakfasts consisting of rice, beans, handmade corn tortillas, farm-fresh eggs, cheese and fried plantains. Like omg, so amazing. Our favorite activity while staying at El Sol was the epic horseback ride through the wilderness with only the two of us and our guide. We stopped for a swim and a delightful lunch at a remote waterfall and had a total blast. We also enjoyed exploring Santa Elena, the small and rustic town just a short cab ride away from El Sol. It was definitely worth the 30 minute walk from the main part of town to a more remote part of town where we enjoyed lunch at Stella’s Bakery and coffees at the Monte Verde Coffee Center. In the main part of town, we were exceptionally pleased with our meal at Taco Taco, where my fried avocado tacos and hibiscus iced tea were to die for. One night we had drinks at another gem, Tree House restaurant. Although we didn’t eat there, the drinks were delish, the atmosphere was very unique and cool, and the live music was so much fun. Tofu & Hummus Wrap at Stella’s. Lunch at Taco Taco. Yum! From El Sol we traveled to Santa Teresa, a beach town in the Puntarenas province situated near Mal Pais and Montezuma. We traveled during the wet season, considered the slow or low season in Costa Rica. We found that some restaurants and shops were closed or had weird hours, but overall we liked the low season because the foliage and greenery were robust and there were far fewer crowds and people to deal with. We zipped from town to town and to each activity on our rented ATV (sooo much fun), and spent our days hiking in the beautiful Cabo Blanco Reserve, the first reserve in Costa Rica, and hiking to each of the three waterfalls of Montezuma. Our day in Cabo Blanco was my absolute favorite day. We made the four hour round trip hike to the most beautiful and pristine beach I’ve ever seen, and because it was a protected beach and because it was the low season, we were the only people there. Incredible. We wrapped up our afternoon with an amazing Mexican lunch at the beach front restaurant, Habenero in Santa Teresa. The food, the view, and the friendly staff were all on point. We actually ended up going back to Habenero for drinks one night and dinner on another as it’s the perfect place to enjoy the Costa Rican sunsets. My trip with Matt to Costa Rica was an absolutely unforgettable experience. Although I have a new found appreciation for the comfort and familiarity of traveling to the same places over and over again, there’s something exciting and fulfilling about seeing and experiencing new places, especially those that push me out my comfort zone. I’ve learned that there are two things I need to fully enjoy a vacation. Of course, fresh, inspiring and delicious food is the first must. And the second must is suitable lodgings that I look forward to going back to between activities. A part of me wishes I was more laid back about hostels and the bed I sleep in while traveling, but that’s obviously not who I am. However, I don’t need to stay in the most luxurious hotel either. All I need is a place that feels clean and where the ambiance is comfy, cozy and inviting. Although there were two nights of semi-questionable hostel lodging, El Sol and Funky Monkey both exceeded my expectations and I would go back to either one in a heartbeat. As I said before, the most important aspect for me when traveling is being able to eat my way through the experience (shocker). The fresh, healthy, farm-to-table dining that was emphasized in each of the restaurants we visited was awesome. This trip was a learning experience and a full-on adventure that opened my eyes to a completely different culture and way of living. I can confidently say that Costa Rica is worth the trip, especially for the traveler with a big appetite for scrumptious food, a love for nature and wildlife, and the need for tons of beachy fun in the sun. Matt and I are really big on camping. And when I say that Matt and I are really big on camping, I really mean that Matt is a camping pro and I’m along for the ride. That’s not to say I don’t love it though. I actually grew up spending my summers glamping (glamourous, more comfortable camping) on my family’s island in Ontario, Canada. While it wasn’t totally “roughing it”, going to Canada definitely made me super comfortable in nature and without the comforts of civilization. The only electricity on our little island comes from a small generator, which is rarely on. To get to the nearest major grocery store takes hours, and the nearest convenience store is a 40 minute boat ride away. On the island, we spend our time reading, playing cards, hiking, fishing, cooking, eating, napping, crafting and exploring. We sleep on old beds in ancient screened-in cabins, perfect for star gazing as you fall asleep, and we spend mornings sitting around the campfire, looking out over the beautiful Canadian wilderness. Sounds magical, right? To me, it’s heaven. In fact, we’ll be heading to Rickey Island in just over a month. Can’t wait. My favorite spot while camping last weekend, right by the water. In addition to our trips to Rickey Island, Matt and I always find time to do a little camping on our own. We’ve hiked to camp, we’ve canoed to camp, and we’ve car-camped. Car camping is my personal favorite, because you can take more stuff and leave the food and valuables in the car. It just makes it a little more relaxing and a little easier, ideal for a short weekend camping trip. And that’s exactly what we did last weekend. Matt and I joined some of his University of Vermont friends and had a wonderful 36 hours hiking and chilling on the water. This campsite, called Black Bear Campground, was totally awesome. One of my favorite campgrounds so far. 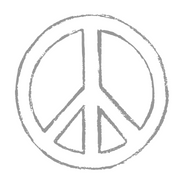 It’s located in Phoenicia, a small town near Woodstock, New York. There were beautiful hiking trails, a wide, flowing creek running along the edge of each campsite, and a couple resident black bears. Yes, we saw a black bear and her cub at Black Bear Campground. Isn’t it ironic? Don’t you think? (I hope everyone picked up on that song reference). After our morning hike, I spent most of Saturday on a chair overlooking the creek with a beer in my hand. It was just lovely. I even saw a group of fly fishers waddle through and one of them caught a fish right in front of me! So cool. View from our campsite. You can see the fly fishers! Anyway, being a whole foodie and cooking addict means that I’m not bringing just any old food supply. One of my favorite activities while camping is the food part! I like planning it, executing it, and most importantly, eating it. So what does a vegetarian whole-foodie bring camping that will satisfy both her and her carnivore boyfriend? Well that’s what this post is all about! Four meals and a few snacks that blend together the essential elements of camping food…simple, fun and satisfying. I’ve even included packing tips and essential utensils, to make prep even easier. Matt and I didn’t arrive at the campsite until 11pm on Friday night, so we didn’t need to worry about Friday night dinner (we ordered pizza while packing up at home). Then for lunch on Sunday we headed to Woodstock for a sit down lunch. Basically this meal-plan covers all the food we needed for all of Saturday and Sunday morning (essentially one full day of camping, plus an extra breakfast before hitting the road on the second day). Use this as a guide and fill it in how you see fit…that could mean an extra dinner and lunch or maybe s’mores supplies for a classic camping dessert by the fire. I hope my tips, tricks and pics inspire you to get outdoors, take advantage of summer and get a quick camping trip like ours on the calendar. Cut potatoes and half the onion into a medium dice. Toss with a splash of olive oil, salt and pepper. Add a thin layer of olive oil to a skillet. Add potatoes and cook over camping stove or fire pit, stirring often to prevent burning. Honestly, ours got super crispy and a bit black/burned on the bottom but they still were amazing! You could also try cooking the potatoes in a foil packet over the camp fire. We didn’t want to start a fire because we were leaving after breakfast to hike, we used a camping pan and a portable flame. Peel and slice 2 hard boiled eggs. Slice 2 ounces cheddar cheese. Use egg and cheese slices to make sandwiches on the English muffins. Season egg slices with cheese. You can griddle the sandwiches in a skillet/pan over a portable stove top or over a fire pit. Or wrap the sandwiches in foil and heat over the fire. Always be extra careful about burning food while camping, it happens easily. Spread about 1/4 cup of hummus onto 2 slices of bread. Top each slice with 1-2 ounces crumbled feta and the reserved roasted red peppers and artichoke hearts. Top each sandwich with a second slice of bread. Serve with all-natural potato chips. Slice eggplant width-wise into 1/2 slices. Sprinkle each slice with salt, allow to sit for 15-30 minutes to let the salt draw out the bitter liquid. Brush each side of each slice with olive oil. Season with pepper. Grill slices on a grate over the fire pit until soft and tender. On a BBQ it takes 3-5 minutes preside, over a fire pit the time will vary depending on the fire. When slices are almost cooked, top with 1 ounce slices fresh mozzarella cheese and allow to melt. Slice tomato. Stuff buns with 1 or 2 eggplant slices, a slice of tomato (seasoned with salt), and basil leaves (or a hefty seasoning of dried basil). Dump mason jar filled with salad into a large bowl and toss. Serve with burgers. I also bought a 1/3 lb beef patty for Matt. We grilled it with the eggplant and he topped his burger with both the patty and an eggplant slice. Spread about 2 tablespoons of Almond Butter onto each of two slices bread. Drizzle with honey or agave (a little goes a long way. Slices bananas and layer over almond butter. Each open faced or top with another slice of bread. I prefer open face (less bread). The view of Phoenicia, New York while hiking. 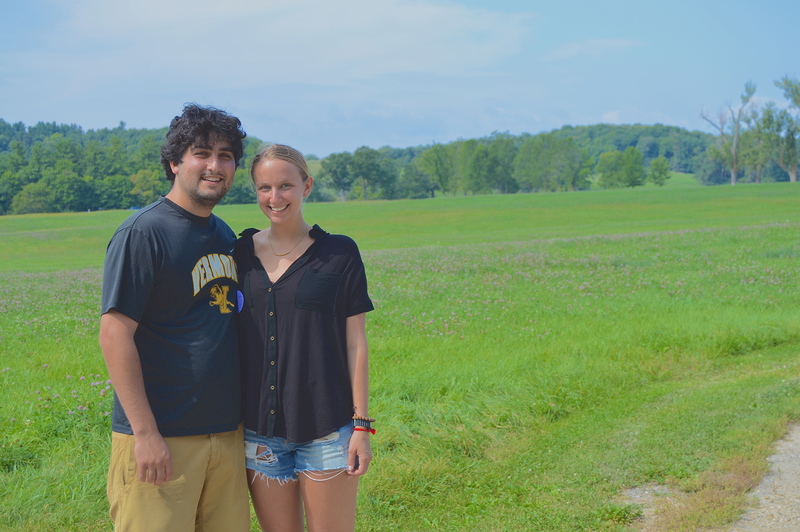 To celebrate our 2 year anniversary, Matt and I planned a 3-day road trip to Burlington, Vermont. Burlington is home to the University of Vermont, where Matt went to college, and has become one of my favorite cities. It’s not too big, not too small, and there are plenty of vegetarian-foodie-approved-eats. So we took the day off work set out at 8:30 on Friday morning, bagels and iced coffees in tow, for our weekend adventure. 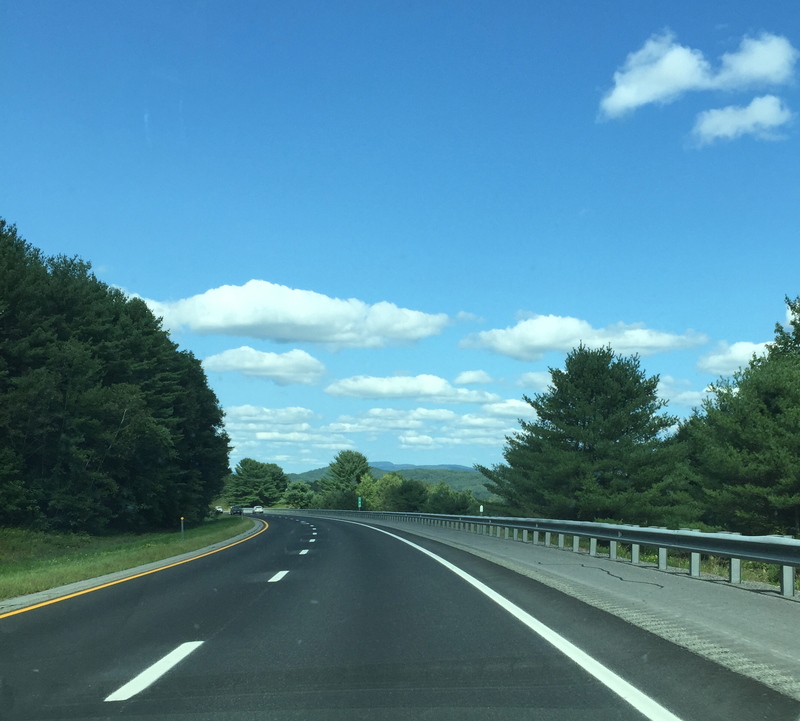 Hanover is right on the border of Vermont and New Hampshire along highway 91. We entered from the highway, greeted by a beautiful park overlooking a dreamy lake landscape. The main street is small, but the uniform brick buildings make it feel quaint and friendly. I had done some research, so we already knew we were heading to a Dartmouth classic for lunch, Molly’s Restaurant. Molly’s was a great decision. The restaurant is huge, and we got a good look at the hard-working brick ovens as we headed to the outdoor back patio. On a perfectly sunny day like this, we were in heaven. And then the bread basket came out. OMG. Warm, crusty, and soft. It was divine. Good start, Molly’s. I ordered a brick oven pizza with fresh tomatoes, spinach, broccoli, and caramelized onions, and we split a garden salad with ranch dressing. The menus was extensive and offered many vegetarian options, but when pizza is in the mix, it’s pretty much a given. The pizzas were as good as to be expected at a restaurant that offers only homemade dressings (a major teller that I always look for). Bellies full and happy, we made our way back to the car, but not before stopping at a cute clothing boutique, Bella, and taking a quick tour of the tiny campus. 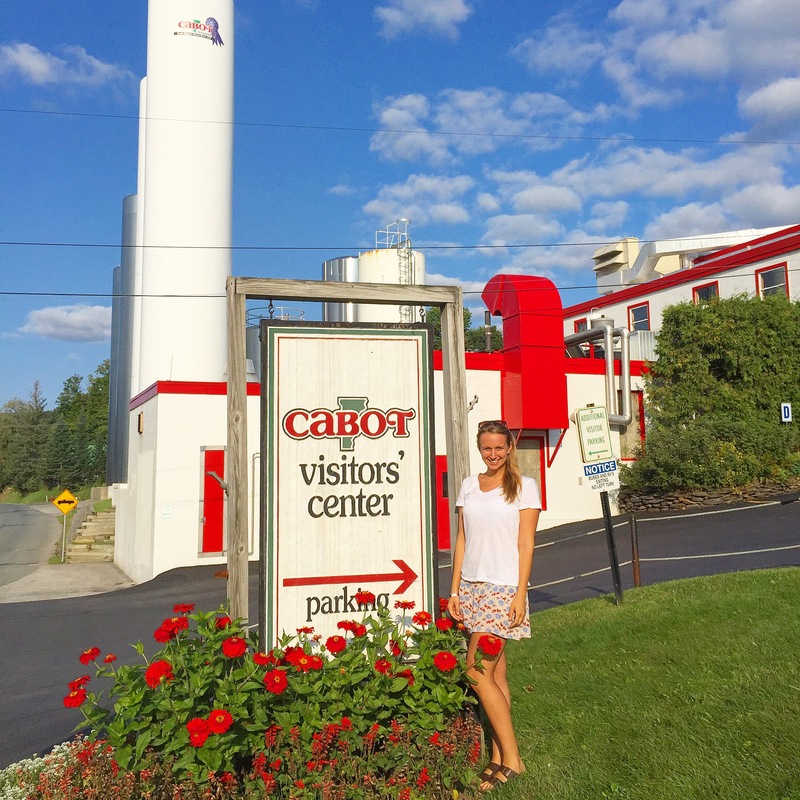 From Hanover we headed to Cabot, Vermont where, you guessed it, Cabot cheddar cheese is made. We arrived at around 4pm, just in time to take the last tour of the day, sample all you can eat cheese (including an Everything Bagel Cheddar), and buy a few goodies at the store. The tour was totally awesome and although I loved Cabot cheese before this, I have a whole new love now. Cabot is a co-op, owned by the select north-east farmers who provide the milk. Their facilities are clean and their staff friendly and passionate. We learned that cheddar is supposed to be white, and that yellow cheese is dyed (at Cabot it’s dyed yellow naturally). The reason for making yellow cheese goes back to colonial times. Americans making cheese would color it yellow so that consumers were able to differentiate it from British-made cheddar. Now days, it’s the expected color of cheddar. Also, I learned that Cabot cheese is made using vegetable rennet (as opposed to animal rennet), making all Cabot cheeses 100% vegetarian. The whole experience at Cabot was perfect and I highly recommend visiting if you have the opportunity. For this trip we decided to camp at a Burlington campground, partly because it’s a lot cheaper than a hotel, but also because we love camping. 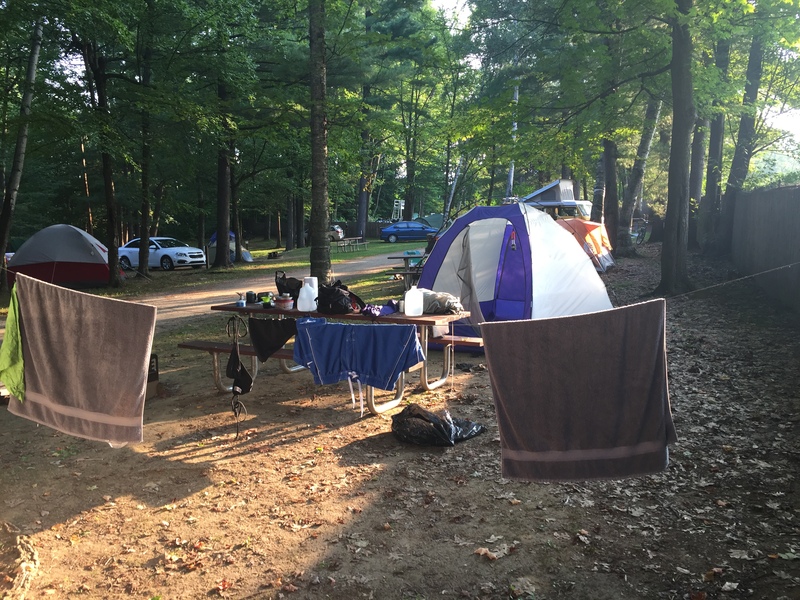 Located on Lake Champlain and just a 30-minute walk to downtown Burlington, North Beach Camp Ground was so much fun.This type of camping is known as “urban camping”, getting to experience both the great outdoors and the entertainment of a lively, small city. And because NBCG is right on the lake, we also got some solid sand and swim time. This isn’t private camping, the sites are pretty close together, but we expected that so we were not at all disappointed. 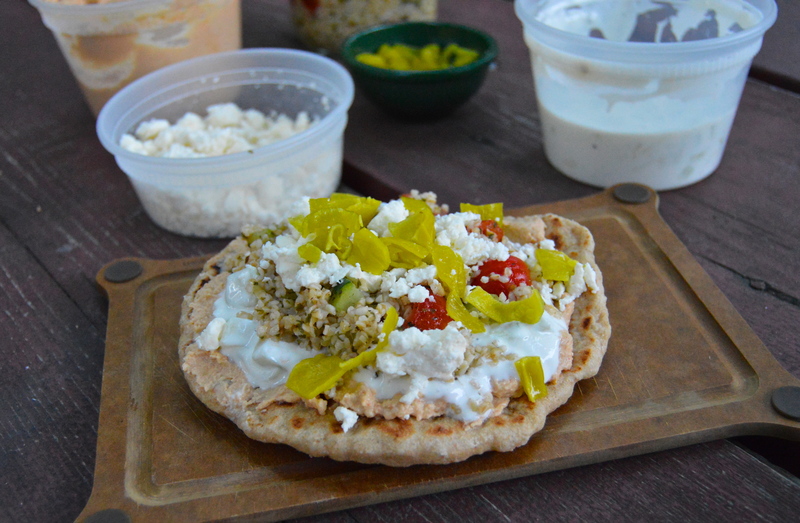 By them time we checked in and set up camp we were exhausted, so we ate a delicious meal that we brought with us, Greek Pita Stacks with hummus, tzatziki, taboule, and feta cheese. The pita, hummus, and tzatziki were made from scratch, while I took a shortcut for the taboule, using Near East brand (it’s my favorite!). This is a great camping meal because it’s tasty, healthy, hearty and prepared completely in advance. For breakfast we ate another great camping meal. 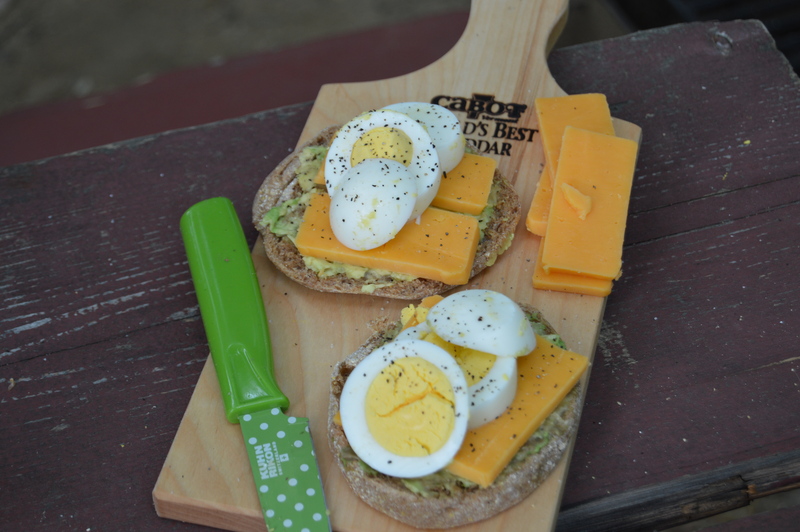 Lightly toasted whole wheat organic english muffins topped with avocado, Cabot cheddar, and sliced hard boiled eggs. Easy, delicious, and packable. We then headed to the beach before making the scenic walk along the lake into downtown Burlington for lunch and shopping. Matt chose the lunch spot located on Church Street (the main drag of downtown which is pedestrian access only). Red Onion is a casual, gourmet sandwich shop featuring sandwiches stacked on their extremely thick slices of homemade bread. My delicious and huge sandwich was made with soft sourdough bread, fresh spinach, raw mushroom slices, onion, mayo, and melty cheese. After some r&r at the campsite, we headed back to downtown Burlington for dinner via Uber (good move…cheap and fast). We put our names in at El Cortijo, a farm-to-table, very casual mexican diner with absolutely delicious, fresh food. While we waited, we walked a few minutes to a couple Heady Toppers (a beloved Vermont double IPA) at a dive bar on Church Street. The outside seating, people watching, and great beer made for a very enjoyable pre-dinner drink. When we finally sat down to dinner, we didn’t hold back. Homemade chips, guar, queso dip, and the best salve we’ve ever tasted followed by delicious burritos. Mine had sweet potatoes, kale, and chili crema and it was divine. This place is a gem! We got an early start Sunday morning to make the most of our last day of the weekend. After packing up camp we headed to Henry Street Deli for bagel sandwiches. This little deli is a bit grungy, but don’t be fooled. The food is fresh and tasty and students flock to this inconspicuous spot for fast, fresh and cheap food. An everything bagel with egg, cheese and avocado was just what I needed. 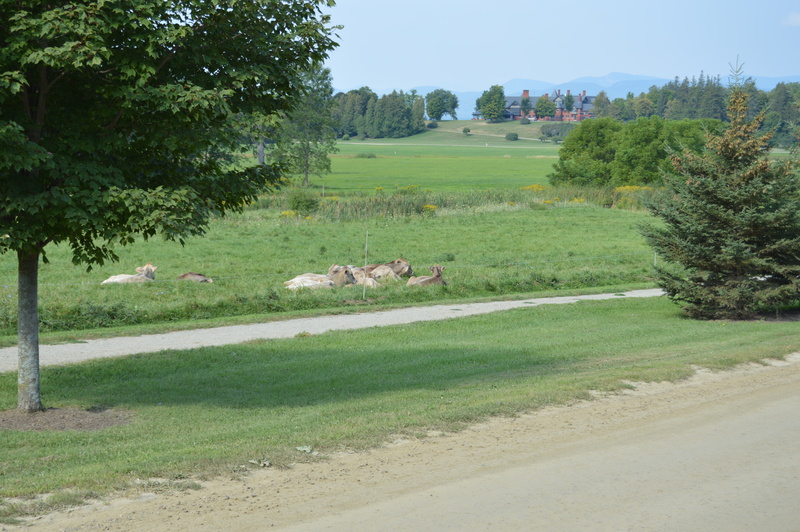 And then, just a 20 minute drive outside of Burlington is Shelburne Farms, our next stop. Shelburne Farms is a magical place. This 1,400-acre working farm was originally a summer estate turned into a non-profit education center for sustainability. We took the first tour of the day, which takes place primarily on a covered wagon pulled by a pickup truck. The grounds, including an Inn, farm animals, lake side floral and vegetable gardens, cheese making facility, and more, are breathtaking. By the year 2020 the farm will be completely self-sustaining using solar power. I loved every second of it. Of course, we bought goodies at this gift shop too which also included unlimited tastings of homemade cheese, dips, jams and mustards. A great way to start the day. From Shelburne, we took the back roads for the majority of the drive back to New York, stopping a few times along the way if something caught our eye. The scenery, fresh air, and country music were rejuvenating, relaxing and centering, a perfect end to our long weekend and a sweet start to our next year together. 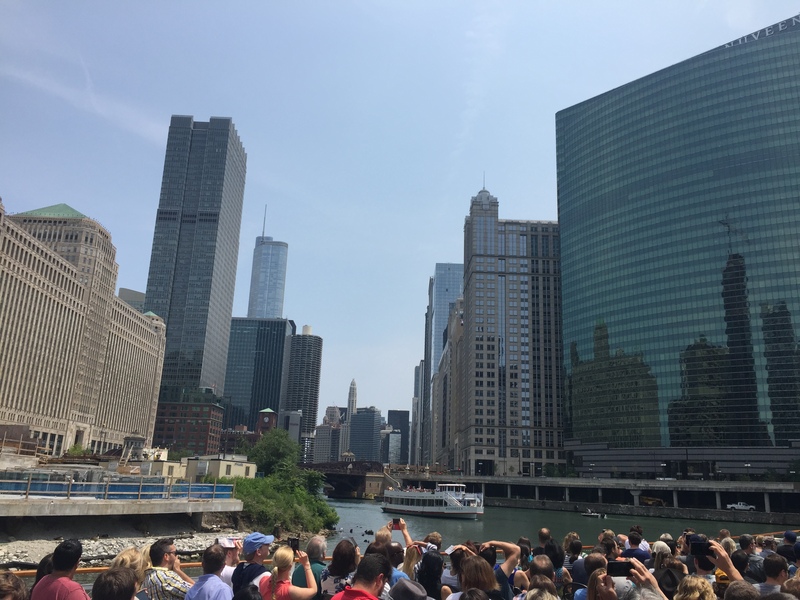 Chicago over 4th of July weekend was a huge success filled with lots of activity and even more food. I’ve been to Chicago plenty of times being that I grew up not too far away in St. Louis, but this was Matt’s first time so that gave us an excuse to be unapologetically touristy for the weekend. While our days were filled to the brim, there are a few highlights that are worth a try in my opinion…. 1. 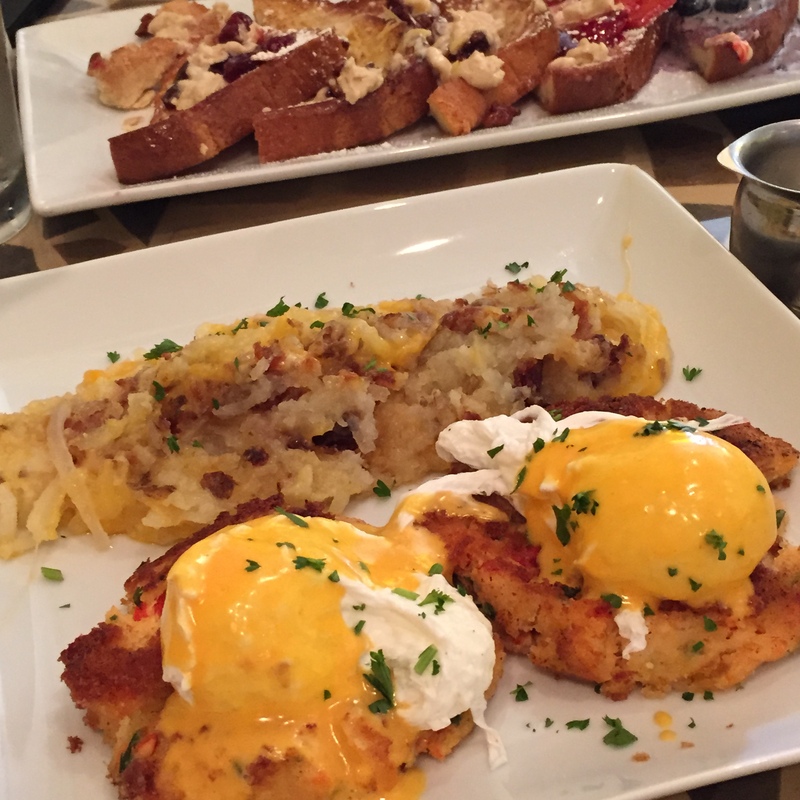 Batter and Berries – This popular Lincoln Park breakfast and brunch gem is an absolute must if you can manage it. Warned that there would be a wait, we arrived at 8:50am and only waited about 25 minutes for our table, but within 10 minutes of our arrival the wait was much longer. The decor is sunny and cheery, the staff is beyond friendly, and the food is homemade deliciousness. Famous for their Super Flight French Toast, we immediately knew we had to try it. The Super Flight includes a half slice of all four of their french toast flavors plus a half slice of the rotating special french toast. My favorite was the Cherry Pie special variety but Caramel Pecan was a close second. Our second entree to split was another special, the Lobster and Shrimp Cake Benedict, which was served with freshly grated cheesy hash-browns. This dish was nothing short of amazing. Good start to the weekend, right? 2. Chicago Architecture River Cruise – From Batter and Berries we hopped on our Divy Bikes (Chicago’s shared bike program, just $7 per day and a great way to get around when it’s nice out) and headed downtown to our Architecture Tour. This tour is absolutely worth the time and the money (about $50 per person after taxes). Our volunteer tour guide was knowledgeable and charismatic and the weather was perfect, so we really lucked out. But no matter what, the buildings and stories behind them are fascinating. 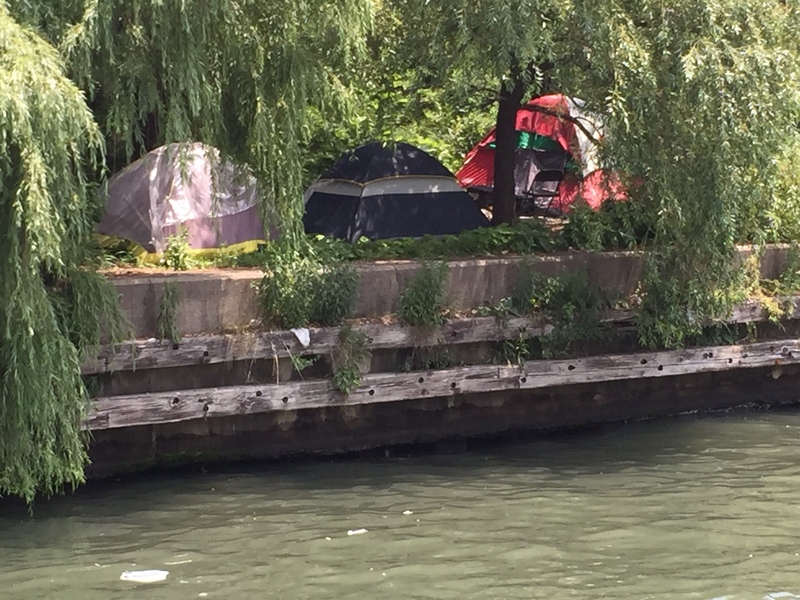 We could even see the tents of die-hard Grateful Dead fans hidden on the river’s edge. The tour is a quick 90 minutes. Be sure to arrive at least 30 minutes early and get in line to secure good seats and drinks at the full bar with time to spare. “Dead Heads” camping along the river. Chicago hosted the Grateful Dead’s final shows ever over the weekend. 3. Green City Market in Lincoln Park – On Saturday morning Matt, my friend Karen, and I had a lovely time walking through the Lincoln Park farmer’s market. There were samples galore of everything from fresh tofu, cheese, pancakes, pickled vegetables, and hot sauces. Along with fresh produce, flowers, and goods, there were also several food stands. 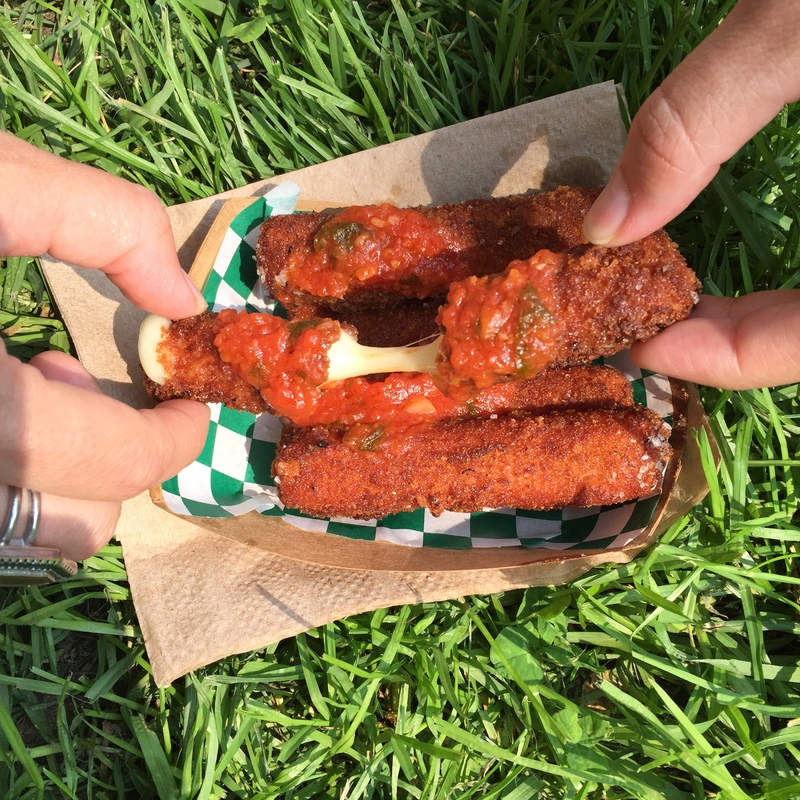 We opted for the freshly made mozzarella sticks from Zullo’s, which were the best I’ve ever had. Before walking around we grabbed coffee from Elaine’s at Hotel Lincoln, right across from the market on Clark. It was fab and just what we needed. 4. Lou Malnati’s – If there was one meal I was going to share with Matt while in Chicago, it was deep dish pizza from Lou Malnati’s. It’s just so good. 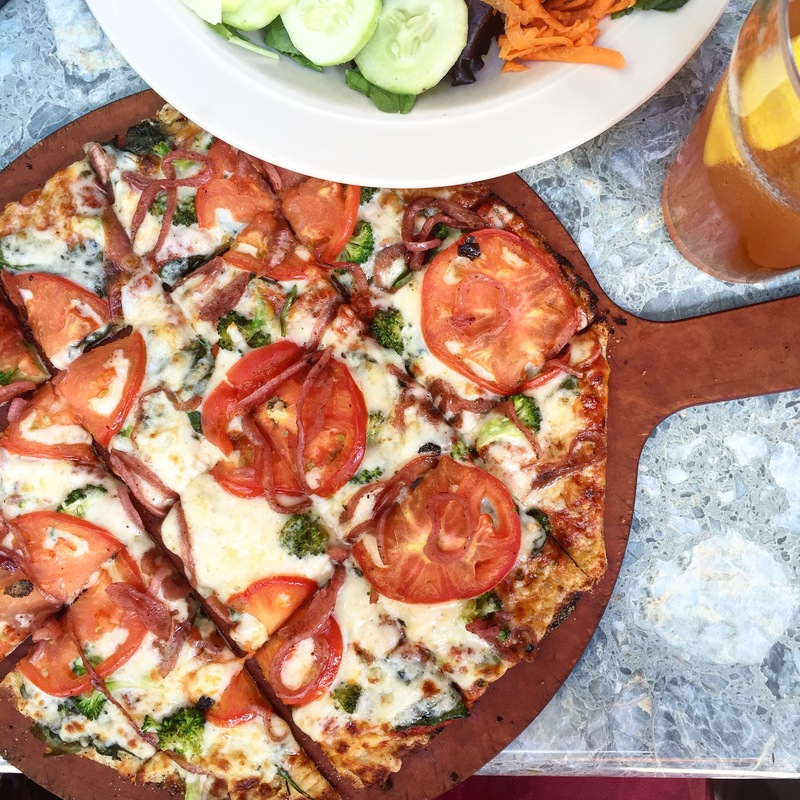 We chose the Old Town Location which is a combination of lively sports bar and crowded pizza joint. 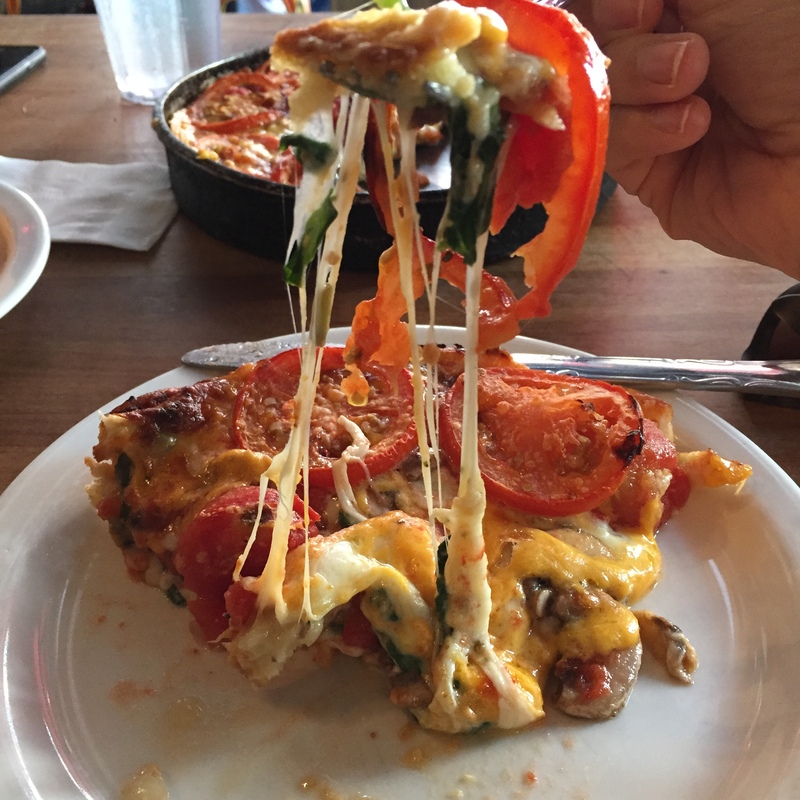 The house salad (salami on the side) was delish, and The Lou deep dish pizza (spinach mix, mushrooms, and tomatoes) was perfectly cheesy and flavorful. Not much more to say about this place, it’s just freakin’ good. What a fabulous weekend in Chicago this was. We cannot wait to go back and try some more!